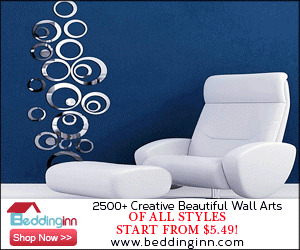 I have a little review for you all today as I am in love with this product. 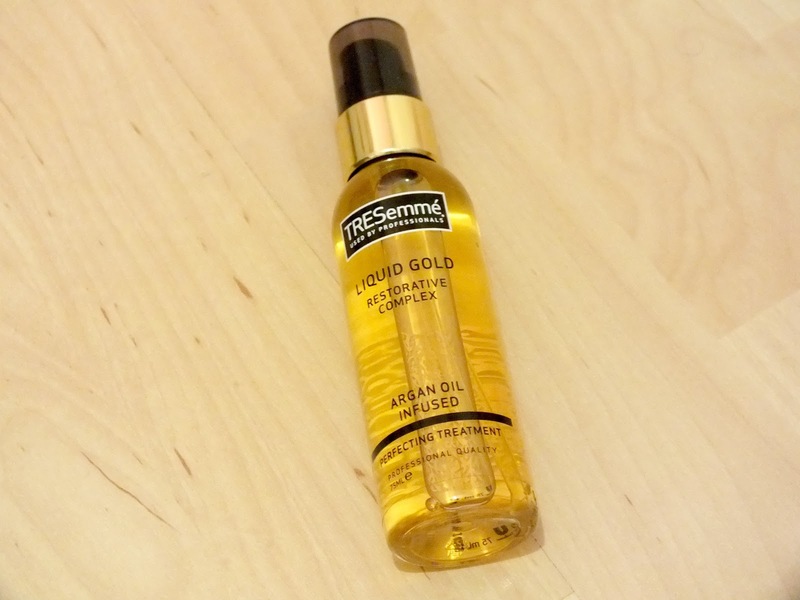 I absolutely adore hair oils and was just running out of my Avon one when I found this little beauty for only £3.45 in Superdrug (it was on offer from £6.99 so hurry if you want to give it a go!). I'd heard good things about TRESemmé Liquid Gold and while I am still lusting over everyone's beloved Moroccan Oil, I can't bring myself to splash out on it while I still have lots of Christmas presents to buy for people! So as this was so cheap I thought I'd give it a go. My hair is quite dry and damaged so any oils and treatments are a bit of a Godsend for me. This contains the ever so wonderful Argan Oil along with Vitamin E and anti-oxidants, which apparently, combined makes for a rather amazing hair product. The instructions suggest applying one pump to the mid-lengths and ends of damp or dry hair. I find I need 2 or 3 pumps but a little does go a long way. This is slightly runnier than other oils I've tried, which is nice because it's so light and doesn't make my hair appear greasy in the slightest. I apply this to my hair from the mid-lengths downwards, concentrating mostly on my very dry ends while my hair is damp and let it air dry (I'm avoiding heat at the moment!) and when it does, my is very soft and smooth and shiny! My hair is quite fine and yet this doesn't weigh it down one bit. I think this is a fab oil if you have never used hair oils before as it's so light so it's hard to go wrong. I loved this product, it leaves your hair feeling super soft and nourished without being too heavy. I have also used this on dry hair to tame it a little and it did a great job. I 100% recommend this and will definitely re-purchase. 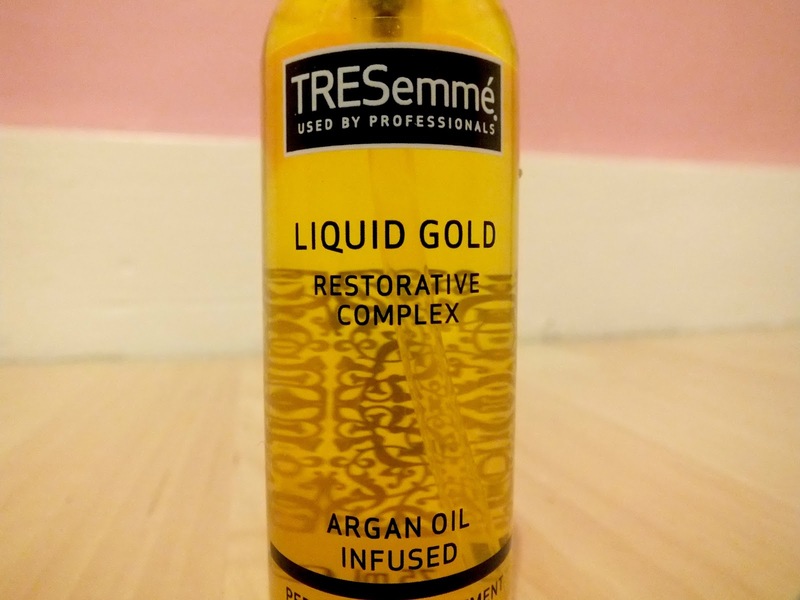 Have you tried TRESemmé Liquid Gold? What's your favourite hair oil? great review! i love hair oils, i've tried a sample of the morraconoil and I loved it! definitely interested in trying something like this, gonna keep my eye open for it! I use MoroccanOil which was nicknamed Liquid Gold when it first game out, kinda funny that Tresemme are calling their Argan oil LG now! Anyhoo, I still have loads left in my bottle but I'll definitely try this one when it runs out.